EVERYBODY'S IN A BUILDING FRENZY! The princes are busy constructing their castles to impress their father, the king. Whoever manages to build the tallest and largest castles will be the new king. Send out your six knights and place your building blocks strategically to prove yourself as a skilled master builder. Who will impress the king the most? 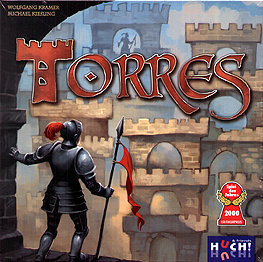 In 2000, Torres was awarded the Spiel Des Jahres prize.